LAKE COUNTY – The Board of Commissioners recognized the service of Larry Greene upon retirement from his position as director of the Lake County Emergency Management Agency at the Jan. 17 meeting. Joseph Busher was appointed as his successor at the Nov. 29, 2018 commissioners meeting. Cirino said the commissioners do not play a large role in running the EMA, which is responsible for the county’s overall safety, and was in Greene’s hands for many years. “What you have done in your time, Larry, is significant and is an achievement that the people of Lake County appreciate, and I know the Board of Commissioners certainly does as well,” he said. Commissioner John Hamercheck stated he appreciated working with Greene over the years, adding he has never heard anyone speak ill of him, calling that a separate accomplishment. “You haven’t talked to enough people,” Greene joked. Cirino noted Greene was the only one who was allowed to call the commissioners at 3 o’clock in the morning. Offered the chance to comment, Greene introduced his wife, who he said had been “on call with him since 1985” and would not miss the middle of the night phone calls. Cirino joked that they would publish Greene’s phone number to help him transition from public service. • Approving final estimate No. 6 (release of retainage) in the amount of $29,740.40 with Monte Construction Company, Inc. and accepting a three-year maintenance bond in the amount of $78,957 For Blissfield and Beechwood Drive Waterline Replacement Improvement Project 405-W for the Lake County Department of Utilities. • Transferring cash from Lake County Department of Utilities Water and Sewer Operating Funds to Project Fund 595, Project 383-W and Project Fund 596, Project 382-S-County Administration Center. • Certifying sanitary sewer repair costs to the Lake County Auditor for Parcel 16D-117-L-00-039-0. • Increasing appropriations and decreasing appropriations within Lake County Department of Utilities Water Project Fund 363-W Maplegrove and Rockefeller Waterline Replacement Project. • Increasing appropriations and transferring appropriations within Lake County Department of Utilities Water Project Fund 595, Rogers Road Waterline Replacement Project 406-W.
• Assigning authority to Matthew Battiato, director of Job and Family Services to act as the Lake County Board of Commissioners’ designee for approving inter-county adjustments of allocated funds. • Approving vouchers date of warrant Jan. 25, in the amount of $523,200.93. • Approving final application #12 (release of retainage) in the amount of $89,314.14 with Town Center Construction, LLC for Lake County Buildings and Grounds / Telecommunications Facility. • Approving payment of bills in the amount of $1,273,397.59. • approving purchase in the amount of $2,068,558.95. • Transferring cash within various general and non-general fund accounts. • The commissioners adjourned to executive session to discuss personnel – collective bargaining and legal matters – pending or imminent court action. There was a meeting Jan. 24. 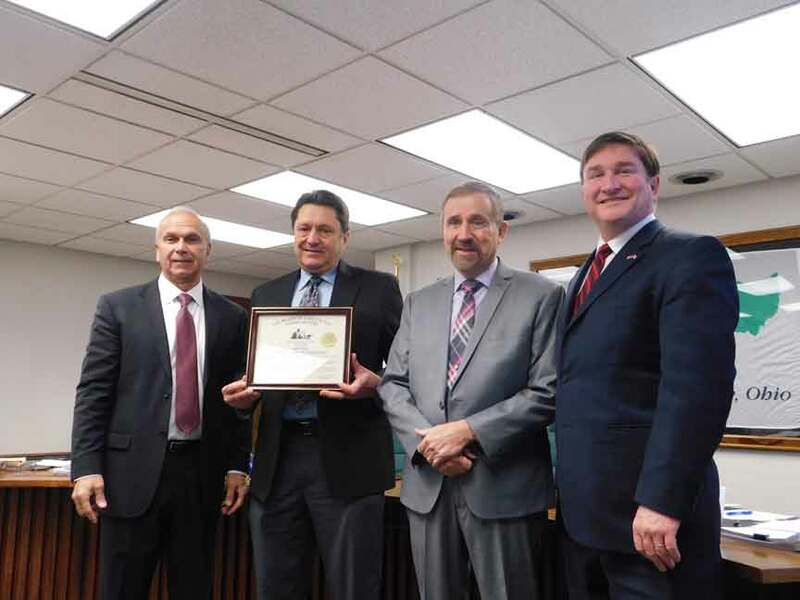 The next regular meeting will be Tuesday, Jan. 29 at 2 p.m.
Larry Greene, retired director of Lake County Emergency Management, accepts a certificate of recognition from Lake County commissioners Jerry Cirino, Ron Young and John Hamercheck at the Jan. 17 commissioners meeting.